OtoSome- Since its release in August 2006, the population of Honda Vario in Indonesia is penetrating 7 million units. This was conveyed by the Marketing Director of PT Astra Honda Motor (AHM), Margono Tanuwijaya. "Honda Vario has been getting tremendous response and has managed to attract more than 7.3 million consumers as well as a trendsetter in its class," he said. This naturally occur article, sales Vario series in 2014 alone could reach around 1.4 million units. 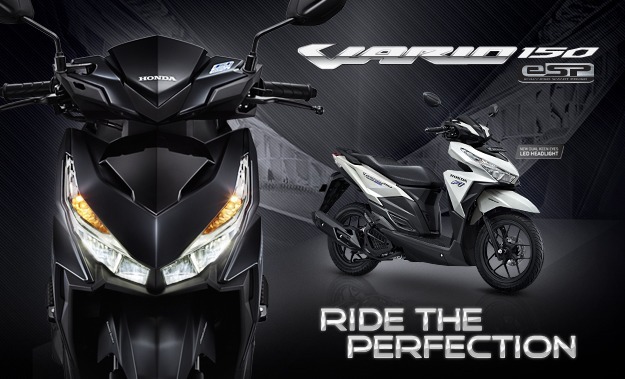 In the first half 2015, sales reached 106.054 units Vario 110CW, Vario 125eSP reached 285 884 units, and Vario 150eSP reached 257 278 units. In early September 2015, PT AHM renewing its flagship variant Vario 110 CW with tech machines ESP (Enhanced Smart Power). The presence of the latest model New Honda Vario be topped ESP ESP application of technology in all variants of the Honda Vario series at all engine capacity from 110cc to 150cc. "New Honda Vario ESP is one further step the company to continue to be a trendsetter. We believe New Honda Vario ESP can answer the needs of people who crave the motorcycle with the best features and competitive pricing," said Margono. New Honda Vario ESP marketed under two types namely type CBS at Rp 15.8 million and Rp 16.6 million for type-ISS CBS (OTR Jakarta). In addition to the new color options Advance Matte Gray, marketed at a price of Rp 15.9 million for the type of CBS and Rp 16.7 million for type-ISS CBS (OTR Jakarta).